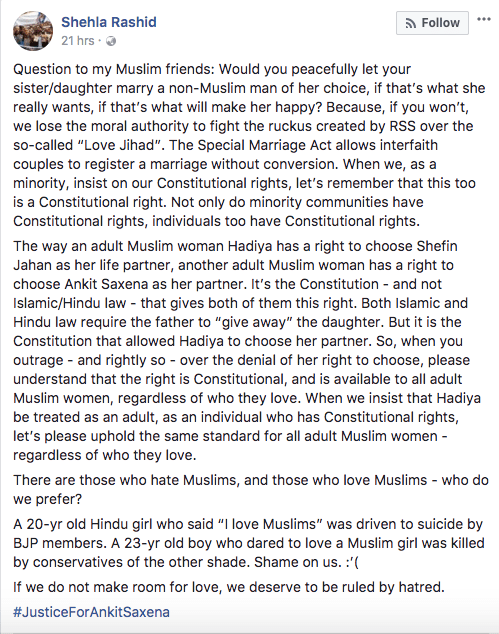 JNU freelance protestor who hangs out with riot instigators in her free time, Shehla Rashid, put up a post on Facebook yesterday asking her Muslim friends whether they would ‘peacefully’ let their sister/daughter marry a non-Muslim of their choice if that makes them happy. She was expressing solidarity with the brutal murder of Ankit Saxena, who was killed by his Muslim girlfriend’s family who were opposed to the relationship. However, the Indian Muslims did not quite agree with her views. One Ziaur Rahman repeatedly asked her whether she chose Indian Constitution above the Sharia, which Rashid chose to remain silent on. 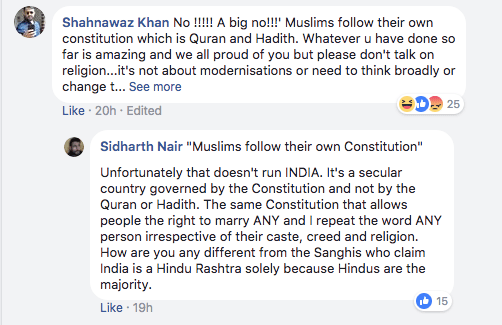 Some even claimed how Muslim should only follow the Quran, which is above any constitution. He even questioned Shehla whether she was having such thoughts because she was in love with a non-Muslim. But some of the most amusing arguments were regarding ‘owner killing’ and one man’s aspiration to stay an honest Muslim (by not marrying a non-Muslim) to be Allah’s best ‘, slave’. 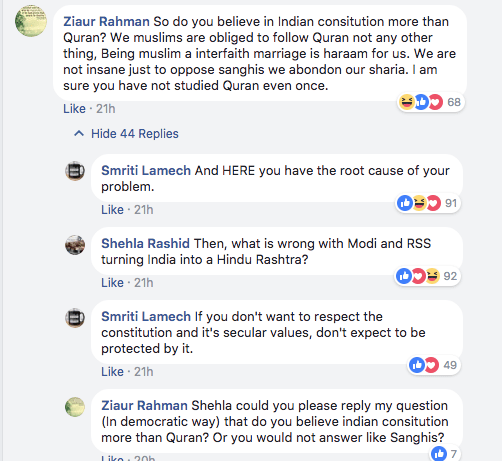 While Shehla didn’t respond to these comments, this blatant disrespect shown towards the law of the land and putting religious duties over the nation is disturbing, and reminds of the TV actor who had openly said that he would choose Quran over constitution of India ‘any day’.